The latest renders of the next iPhone solve the problem of the sensor notch by seamlessly integrating the status bar into the black cutout. By hiding the carrier name and eschewing the time display altogether, it turns out you can cram the signal and data connection on the left hand side of the notch, and put the battery, bluetooth, and whatever other icons you might have on the right. It doesn’t look half bad, either. There’s no way The Rock x Siri movie could have been a feature-length film. Instead, it’s a short that shows off The Rock doing The Rock things in everyday life, with Siri as the personal assistant helping him every step of the way. It’s about how much The Rock can get done in a day with Siri, and it’s a fun, lighthearted look at showing off Siri’s capabilities while not being too over-the-top. Apple has released the fourth beta of macOS High Sierra to developers, and that’s about all there is to say for now. We’ll probably see the same update released to open beta members in a few days. Same deal with the recently released fourth beta of iOS 11. Changelogs say that Apple has fixed some issues and now knows about a few new ones. There’s a few new strange bugs that Apple knows about in this release — nothing particularly show-stopping, but definitely some minor nuisances, as well as revamped icons for Notes, Reminders, and Contacts. While we’re still over a month away from the proper release, 9to5Mac has a run-through of how the iOS 11 Files app works. It’s probably not feature-complete just yet, but most of the functionality is there, and core functionality of Files is unlikely to change between now and the official release of iOS 11. Rumours from the supply chain indicate a slowdown as non-Apple suppliers enter a holding pattern to see what Apple releases later this year. It makes some sort of sense from a logistics perspective — you’re not going to want to end up with too much excess stock in your channel, so best to slow down production until you see what the next iPhone will be like. A report from MacRumors says some users are getting their Early and Mid-2013 MacBook Pro models with Retina display replaced with the equivalent 2017 MacBook Pro model. Constraint on the top case with battery assembly are the reason why, so provided your machine has an issue with the battery that requires service, there’s a chance you can get a new machine as a replacement. Macworld’s Glenn Fleishman answers the question of whether HEVC and HEIF video and image formats will work in older versions of iOS and macOS. Graceful degradation are the keywords here, and Apple will err on the side of compatibility to make sure your cat photos can be seen by all and sundry. The latest ARKit demo is probably getting pretty close to what giants like Ikea want to release, demonstrating putting furniture in a space and adjusting dimensions. Stephen Hackett tells us about three tiny laptops. People seem to think the non-Retina 13-inch MacBook Pro was pretty good for its time, but there’s no forgetting the PowerBook Duo, 12-inch PowerBook G4, or more recently, the MacBook Air. As for which machine was better, well, you know where I stand. 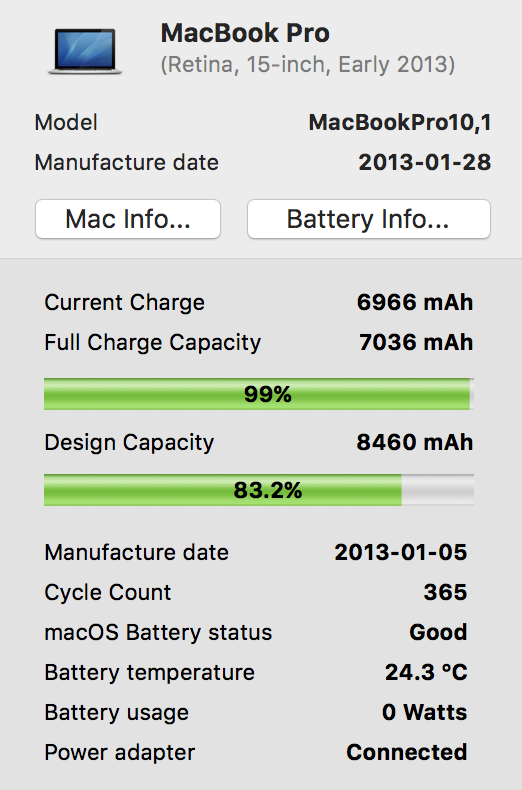 I’ve got an Early 2013 15 "MacBook Retina Pro … I will have to check out the battery health and see what’s what. Sadly I think it’s all OK which means no cheap upgrade. Ahh I can dream right?! I think my favourite replacement stories were when people had their water cooled G5s replaced with first-gen Mac Pros. Now that was an upgrade. water cooled G5s replaced with first-gen Mac Pros. That would be a pretty nice upgrade. I know mine doesn’t hold charge as well as it used to, but the health check is actually lower than I thought it would be, especially for only 365 cycles. 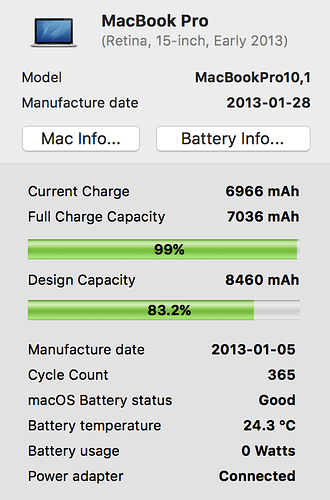 This one has never flagged (I’ve had older poly MacBooks that did) as needing a service.